A new-build 31 metre motor yacht has been sold to an American couple by Tom Caruso at Total Marine. Currently being completed in GRP at Cerri Cantieri Navali to RINA class, she is scheduled for delivery in summer 2018 as a Flyingsport 102 model with a light metallic champagne hull finish. Interior designer Tommaso Spadolini has developed an American-style layout with an open-plan kitchen on the main deck. Accommodation is for eight guests in four cabins consisting of a master suite, VIP suite and two twins, all with entertainment centres, television screens and en-suite shower facilities. The Flyingsport 102 range also boasts two pleasant outdoor areas: at the bow is a day area with a large sunbed and a huge round sofa that can comfortably seat up to 20 people, while at the stern on the main deck, the cockpit features a comfortable sunbathing area and a dinette with a multi-functional table for cocktails or casual meals. The 28 square metre flybridge hosts a second helm station, an extendable dining table aft, a barbecue and a large sunbathing area. Twin MTU 2,600hp diesel engines linked to ZF Searex surface drives power her to a cruising speed of approximately 30 knots with a top speed of 40 knots. 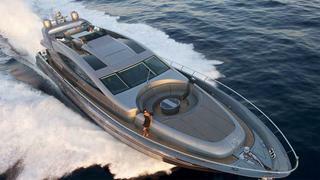 A key selling point was the draught of just 1.2 metres, as the owners are keen to cruise in shallow American waters. The asking price of the CCN Flyingsport 102 is undisclosed.